Responding to the call of sweet and pungent lagoons and cumulus-specked oceans, I built a cruising sailboat in my front yard during 1969 and '70. A Brown-designed Searunner trimaran. At 31' it was the smallest boat I felt would be safe anywhere in the world short of the "ultimate storm", and since the Fall of 1973, almost 8,000 nautical miles have passed under her bottom between San Francisco and Newport, Rhode Island. The boat is still solid and in one piece, and I and my crew are now crammed full of experiences, acquaintances, and bits and pieces of knowledge both trivial and important. Not boasting of great experience and prior adventures, I asked hundreds of questions and read what seems as many books while outfitting. What's really the minimum necessary equipment for safe ocean cruising? In San Francisco I was bounced from minimalists who shuddered at the thought of an engine or radio to those who insisted upon refrigeration, and wouldn't leave the dock without the single-sideband warmed up and ready. Finally I heeded the directives of the Oceanic Society's Patrol. These had been worked out along Midget Offshore Racing Club (MORC) requirements by many concerned persons sailing oceangoing boats. I found also that many books written by cruising people have in them appendices and lists of things they took: medical kits, electronics, food, safety-rescue equipment, nifty gadgets and not so nifty gadgets that break. Among the several gadgets I chose to take, the one I now consider essential and which served me well throughout the trip, is a VHF-FM radio with 25 watts output and 12 channels. It deserves discussion as a navigator's boon. We sailed shipping lanes, at first not by choice, then later, as we became familiar with the traffic and with range and running lights indeed by choice. Fog was not a problem south of San Diego in the Pacific, nor was it particularly frequent along the Atlantic seaboard and New England during the voyage, so we were secure with our lookout system. It worked like this: We set the self-steering vane and adjusted the course, got out a good book, and read during watches, checking the horizon every ten minutes or so. If we spotted a commercial vessel we kept our eye on it until it either went away again or got closer. If the ship grew larger and seemed to be heading towards us we would call it up on Channel 16 or 13 VHF and check to be sure we were seen. If our radio call received no answer and if it was night, we would blink at it in Morse code with the searchlight (an ordinary automobile headlamp bedded into a teak salad bowl with a switch) a succession of concatenated A's and await a response. This is the calling and attention signal which states one wishes to converse by lamp. After the vessel had set up its light and returned the signal with a series of T's (which mean go ahead with the conversation), we would skip the call signs and formalities and simply blink VHF. Crackle, static... a voice would come up on Channel 16 as if by magic. When the voice came up it was usually good for a long gam and a fix and weather reports. The big boys out there get lonely (just as we occasionally do) and they often enjoy a session on the telephone. We found that the farther from civilization we were, the longer the telephone contacts, and the greater the curiosity about our trip. Eighty miles off the Mexican coast we spoke an American supertanker also headed southward along our track. We initiated contact shortly after sighting its stack astern, and by the time it was on the horizon ahead we knew within a mile our position by Omega, we had had a good "look" at the weather from a satellite weather map facsimile printed at several hour intervals aboard the tanker, we had exchanged gossip and addresses, and the captain ("call me Charlie," he says) had matter-of-factly stated that neither he nor his crew would like to trade places. This last we took in stride, but when he changed course and headed back at us we got on the radio to see what was cooking. His wife, says Charlie, wouldn't believe this story unless he took some "Polaroids", so don't worry, he was slowing to five knots and would circle us 100 yards astern. There he was on the flying bridge with a camera, snapping away. We got him, too, because some of our friends wouldn't believe a tanker changing course in mid-track out of benign curiosity. We were happy, as well, because our DR was within five miles of his fix and my celestial navigation was working beautifully with H.O. 249 (highly recommended). In the worst weather of the trip we were sailing with four other yachts in radio contact on the leg from Acapulco to Salina Cruz. At 31' LOA we were by far the smallest, but it was some comfort to be running bare poles in a Tehuantepecer and to hear the clear voices of the others and to sort of spread out the anxiety and to know that aid might be close at hand. Arriving at Salina Cruz under strenuous conditions and in 60 to 80 mph offshore winds, we were able to motor through the breakwater (in one hour we made about 1/8 mile upwind, playing the lulls, and with the engine at full). In the inner harbor we side-tied to the lee of a large shrimp boat. By radio we discovered that another of the yachts could not power in, and had anchored precariously behind a small bluff. We went ashore, found the Captain of the Port at Sunday Mass, and were able to get a tug out to bring the yacht in. The sun was setting, and a family with two children had been spared a nasty anchor watch, and possibly a disastrous offshore survival regime. After 10 days of a 12 day passage we spoke a British banana boat off the Costa Rican coast. In a watertight cracker tin they threw us a carton of cigarettes and a package of cigars ("Compliments of the Captain," the note said) in response to a gam and the mention of running low on tobacco. We thanked them three days later at Golfito. Rounding Punta Mala at night, and caught between a nasty blow and adverse current, we sighted a phalanx of cargo vessels which became a "convoy" as soon as we made radio contact. A lock in the Panama Canal was being overhauled and north and southbound traffic was put through in groups. Thus we saw half the day's traffic through the Panama Canal coming at us at once, looking like a red, white and green city on the horizon. We radioed a general security message that we were there, close-hauled and fighting the wind, and we received kind replies from most of the vessels. They passed so close that we could make out company names on their hulls with our lamp. One even slowed and brushed past so near that we started the engine in defense. He was just curious, I think, but he did manage to scare us. My feelings about travel in the lanes are thus: Drive defensively and maximize your ability to communicate. Fog is the singular danger; if you can see them, you can get out of their way. Most cruising boats have auxiliaries, and if you learn to judge range lights it is easy to stand well clear. We use the same routine going under drawbridges while sailing ... get the engine running in neutral and then use it if you have to bail out. Incidentally, the more active drawbridges guard Channel 13 in the United States. With cargo ships at sea there is much more time for planning evasive action (assuming your watch is alert), and there is no need to panic when you see lights on the horizon. Of the perhaps 100 vessels we sighted along the way, only twice did we start the engine, and never did we have to alter course. The VHF kept us in contact with other traffic, and indeed, that's what it's for. Channel 13 is the bridge-to-bridge frequency used by commercial vessels and is guarded 24 hours by all vessels plying US waters. Leaving the Golden Gate in heavy fog we negotiated the San Francisco Bar using Channel 13 and a "borrowed" radar from a passing cargo vessel. On the Delaware River from Philadelphia to the Chesapeake Canal we spoke tugs and freighters, and word was passed down the line all the way to Cape May that a sailboat was southbound. Our position was logged sort of as a moving obstacle as we felt our way along the unfamiliar main channel in a foggy night's ram. Sailing past the United Nations Building toward Hell Gate on the East River, we were in touch on Channel 13, and managed to avoid several sticky situations in that super-congested waterway. When a tow asks you to meet him on two whistles, it's port to starboard; the pros don't demand right of way, they work together! So the VHF is a tool, not a gimmick. The people who make a living on the sea use it to good purpose,and are generally precise and crisp in their language. Listening awhile to their talk, you can pick up the jargon. More than a few times we have surprised commercial vessels by understanding the use of the bridge-to bridge channel, and by being as involved and serious about inclose piloting as they are. Used to yachts getting in the way or being just plain stupid, they are pleased to hear from a small boat asking how he can make the big fellow's life easier. English is the universal language at sea, and aboard every vessel at least one officer is reasonably fluent. It is the language of commerce. A Norwegian cargo vessel, for example, making the run from Valpariso to Buenos Aires will take on a pilot for the Straits of Magellan; the pilot will speak English and a ship's officer will speak English. Orders are given in English and if necessary, translated to the seaman at the helm. Late one night we blinked a freighter on the horizon, and it was perhaps 20 minutes before we received an answering T. When we then switched to VHF we heard a schoolbook voice with a very classic Hollywood Japanese accent ask Who are you? Very slowly we explained who we were and that we wished a position report and, if it was no trouble, a weather forecast. I am afraid the watch had had to wake the captain. Nevertheless we received the courtesy extended all seafarers, and when the information had been passed, we heard a diction-sharp That is all, goodbye! In the Caribbean enroute from the San Blas Islands to Jamaica we crossed the Cristobal-Mona-Passage shipping lane. We spoke a German Volkswagen carrier returning to Europe empty. I got to practice my own German, and aside from giving us a position fix, they were kind enough to notify my family of our location and health. We had heard many stories about small boats running aground off Cuban shores in the Windward Passage, and we were being quite careful with our DR. However, there are some tricky currents, and for three days we had been unable to get a reliable celestial shot. The Northeast Trades seemed to have petered out, leaving the sky filled with haze, huge squalls and torrential rains. We encountered our first waterspout here, and will always remember this place for its oppressive and uncertain air. Approaching Punta Masi after midnight we saw what seemed to be a small town - a string of powerful mercury lamps evenly spaced on the horizon. By our DR it shouldn't have been there, for we calculated 12 mile clearance from land. Had the currents and light airs put us close on shore south of the point? As the lights grew into sharper resolution in the binoculars we tacked away to the east, and I went below to recheck our navigation. Finally I decided that we couldn't be that far off our DR, and we tacked back for a closer look. The water was deep right up to land, and by this time we had to know! As the lights grew in brightness we could make out what seemed to be a radio tower with red lights, and it looked more and more like a village. Then at about two miles off, all the questions and doubts were resolved. It was a large container ship drifting out of control with two red lights set about six feet apart in a vertical line. If we had seen range lights or a colored side light, we would have known it was a ship all along, but all lights above the deck were extinguished with the exception of the reds and the bright mercury lamps. They were perfectly correct under international rules. We raised the ship on Channel 16 as much out of curiosity as from a desire for a position fix. It turned out to be of Russian registry, and the voice in very broken English seemed to be quite harried. We wished them good luck with repairs, and when they answered No thanks, we don't need your help, we realized they had misinterpreted. 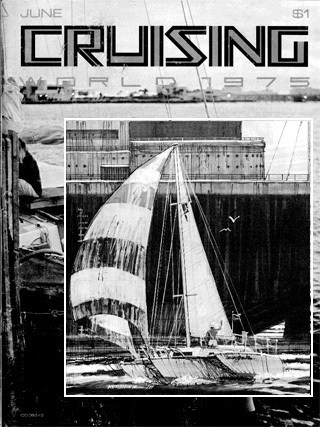 We enjoyed the new thought of going to the aid of a drifting freighter, and throughout the night built up a series of playful fantasies about heroic rescue on a 31' sailboat! But the most scary thing for the small boat crew making a passage is fog, and even with a big radar reflector and radio contact with the pilot riding the invisible ship, you grab the tiller a little tighter, lean forward, and look around as the tiny cones of the running lights reach into nothingness. Yet, thinking back over our 10 months voyage, we had fog only as we nosed out through the Golden Gate and again as we entered Newport, RI.